After rescheduling not once, but TWICE because of rain, the Good Lord finally decided that this week was going to be the week that we got to hang out with Katie and Patrick on their farm for their Maryland engagement session. The weather was finally beautiful – not humid at all and actually a great breeze which is so rare for Southern Maryland. Usually we’re sticking to ourselves because it is just so humid! Katie and Patrick’s wedding just might end up being our favorite “backyard” (if you can even call it that) wedding. After their engagement last night, they took us to tour Patrick’s mom’s new home in La Plata. We have a STUNNING wedding on our hands! Pair this one of a kind venue with this gorgeous couple and their hilarious friends – it’s going to be the party of the year! 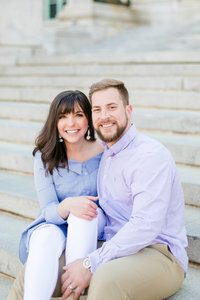 See more Maryland engagement sessions here!